Basin Street East was a notable nightclub of the 1960s in New York City. 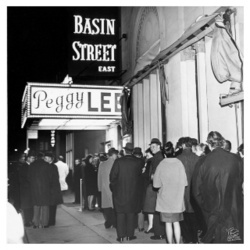 Several live albums were recorded there, including Peggy Lee's Basin Street East Proudly Presents Miss Peggy Lee (1961), and Billy Eckstine's At Basin St. East (1961). The club was located in the Shelton Towers Hotel (now called The New York Marriott East Side), and replaced a previous club in the hotel called Casa Cugat. ^ a b James Gavin (11 November 2014). Is That All There Is? : The Strange Life of Peggy Lee. Simon and Schuster. pp. 217–. ISBN 978-1-4516-4168-4. ^ "The New York Marriott East Side". thecityreview.com. Retrieved 17 March 2015. This page was last edited on 3 October 2018, at 05:38 (UTC).